Welcome to the NeocoreGames Bug Tracker! 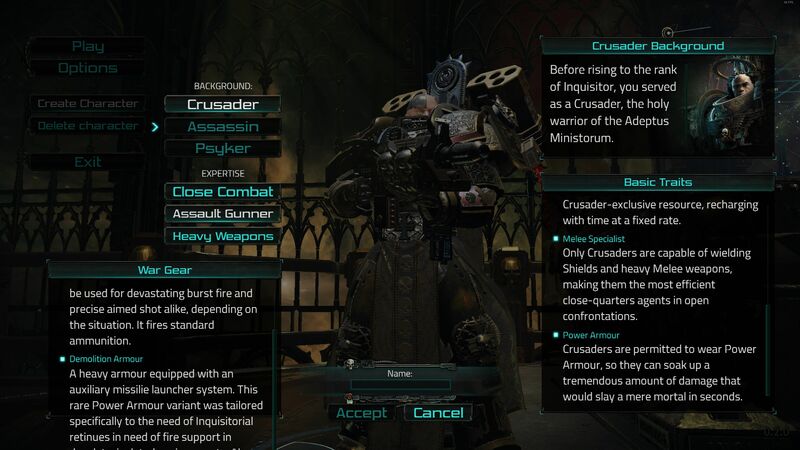 You can report bugs you've found in Warhammer 40000: Inquisitor Martyr using this bug tracker tool. The bug tracker will be implemented into the game in the next update. Before you report a bug , please perform a search first to see if someone has already contacted us about it to prevent duplicate reports being made. Submit ONE issue per report please, it's easier for us to follow and manage! Please provide a (to the point) summary of your problem. Avoid one worded summaries and things like "help!!!". The description should contain details of the problem and how to reproduce it, so that we can more easily track down the problem and try to fix it. Please search before creating a report to make sure your issue hasn't already been reported. If it has, please join the discussion there! Please take your time to read following instructions, so you can make it easier for us to identify and fix the reported issues. There are tons of different systems and different issues which will be caused by different things. Too much variables to guess right. Check if the right game is selected in the top right corner. DO NOT report Warhammer bugs for Van Helsing and vice versa. Try to reproduce your issue using a recent version of the software and an updated operating system. Use the search box to see if your issue has already been discussed. Reporting an issue is fairly simple. However, the more information you give us, the better we’ll be able to help you to fix the problem. So, when you describe the issue, be precise - be clear. What did you expect to happen? What happened instead? If you have any questions, ask here or on PM me on discord. When I get home, I'll make a short video about this to make reporting easier. Version 0.1.6 is not in the drop down list when submitting a bug so I guess it's better to wait for it to be added. 1: Right clicking items into empty slots seems to have a lot to do with disappearing items. Has happened to me more than once today. Equip, go to mission and have no weapons or gear in some slots. There is no particular place you teleport to that this occurs. 2: Grenades and Tarantula have a problem deploying even with full bars of health and energy. 3: Some times when the red stuff (Q) is low and ever thing else is full it does not fill up as fast as other times, it is fast at times and slow at others. 4: When no weapon is equipped in a slot and you continue the play through without one the character will skate when the no weapon is initialized to move faster. 5: Items that are returned for the loses can not be sold and if right clicked to do so they disappear. Also had a copletion chest disappear right clicking it to open it. Should our Neocore accounts and password work, or do we need to create another account in Mantis? well mine does not so gess its another thing we need to sign upto. Is it relevant to report missing sounds as issues at this stage of the alpha ? Anyone else getting a 404 error from the Bug Tracker? Thanks for your feedback Sharpe! There is a button on the top left part of the game when on the command bridge that freezes the game when clicking on it. There is also a text under that says 'accept your rewards to start a new game" and I don't see any reward. And also, sometimes, when using heaving gun machines, inside the game, it's sometimes not working to get out of the gun machine even clicking E.
Thanks ! And "courage les amis"
Can some one tell me is this correct link to Bug tracker http://old.neocoregames.com/mantisbt/view_all_bug_page.php ? v0.2.0 needs adding as an option in Mantis. i WISH I HAD NEVER BOUGHT THIS GAME! IF IT IS GOING TO CONTINUE LIKE THISI I have tried every location after the newest update and have not been able to complete any of them. I have told you before that they shoot all the way across the rooms and even before you can see them throught the doors. Now do they not only do the above, but have even more damage and we only get 2 inoculators and the cool downs after switching weapons is still there. Come on guys you can make it better than it is now just like in Van Helsing. Get with it! Ehm, you buy a game in alpha phase. What have you expected? A full working game with all content and completly balanced?! Before the patch it was just boring after few missions because there was no challenge. Enemys were too weak, selfheal (HP-regen) too high, dmg taken too low. Now it's hard at the beginning (for me I like it this way), especially playing melee with chainsword. For casual gamers it might be too hard and unbalanced, but its still alpha, so balancing should not be the main part of current development phase. Alpha should make the game work, trying to fix all the issues resulting in game crashes and such things. Balancing is a thing you can do with lots of players where lots of builds are played and you can compare them. Can't use it. No confirmation email, so can't register. In summary the problem is not being able to claim (x) crafted item. Per Screenshot it shows a completed status, clicking the finish button does however send visible and audible ques of confirmation. I have recreated this problem 3 times in a row by starting the production queue with different items, and while in production logging off. If the time spent logged off goes past the completion of item, said item is irretrievable. If logged back in before allotted time is up, item is retrievable. In addition this bug does lock up the crafting station, you have to create a new character to craft items. 1920x1080 p on a 4k 55in monitor. Win 10 x64 i5-6600K CPU 3.50GHz 32 GB RAM GeForce GTX 980 Ti. Text in the bottom left of the image goes off screen. You can still scroll like normal, you just can't read the last sentence since the bottom of the text box is off screen. The image shows the text after I scrolled as far down as it will go. Also, if you leave the options open and then click create character, options will not close. Character creation will simply overlap the options menu. If you click cancel during character creation it will close options as well as the character creator. I equipped the Inquisitor with a thunder hammer. He held it like a rifle and did not swing it. Also he no longer walked but floated around the room. The sound was correct like swinging of a hammer and he still did major damage. So not a performance bug, just an animation/visual bug. Quite funny actually. Sound out of sync in game / some sound present (like running sound, menu/ui sounds) but no weapon/shooting sound at all. Ofc all sound settings are On in game options menu. Tried to reinstall game twice via steam. No result. My rig is iMac Late 2013 with i7, SSD PCI-E, Nvidia GTX 775M 2 GB, 16 GB RAM, Windows 10 Pro x64 build 1607. Latest bootcamp drivers. No issues in all other games. Game is patched to the latest version. Cant create character. Menus are also barely usable. Blue screened my computer on first launch with a video scheduler error opened game again and everything looked messed up. Would post an image but the site isn't letting me. Black pixels all over the scream. menus lag. Goes to create character lag continues. No character is rendered I click on crusader then the heavy weapons and it freezes. At this point I am forced to exit the game with task manager. The only thing I can think is happening is its trying to run on intel graphics and not the Nvidia processor. Can be remedied by browsing the games local files (right click on game in steam games list) and right clicking on the game executable and selecting the Nvidia processor under the Graphics processor tab. (I then shortcut this excecutable to my desktop). Other than that ensure your drivers are up to date and you shouldn't have any problems. This weeks bug. When fighting a Dreadnought I like to run him around the room (as probably everybody does). Some obstacles he can shoot through (both guns and grenades), while others he cannot. In both instances I cannot return fire through said obstacles. Not a deal breaker just an fyi. I'm still having a boatload of fun! I am having this same problem. Cannot receive the finished item and cannot start another. The game has been crashing consistently, every game. Earlier today I couldn't download nvidias latest driver? But for some reason getting a crash per game. 4/4. Can you send a detailed email to the support team with a dxdiag? Actually this is incorrect. I have made another character and crafting is still locked up with the same exact item. It would seem all credits and fate are transfered to all characters on the account as well as crafting items. I to am experiencing the crafting bug. First couple times were successful but then an item got stuck. It says its finished but the item is irretrievable. The game is crashing a lot less this week. Aye that's the exact problem I have though I've never had any crashes. Lucky I guess. 2: i got 2 screens when i swap screens during loading the game gets stuck. 2) every time i swap to my second screen doing loading it happens. My friend gets black screened if hes in a menu when i start a mission up that last the entire mission. Gas chamber doors delay opening when destroyed so the room remains filled with gas that may kill multiple times before it opens. and sometimes rapidly regen while being destroyed. Sniper shot doesnt charge when used on world bearer decimator boss it only fires immediately even if you hold down key like you would for any other enemy. Anti-Aliasing not functioning at all. 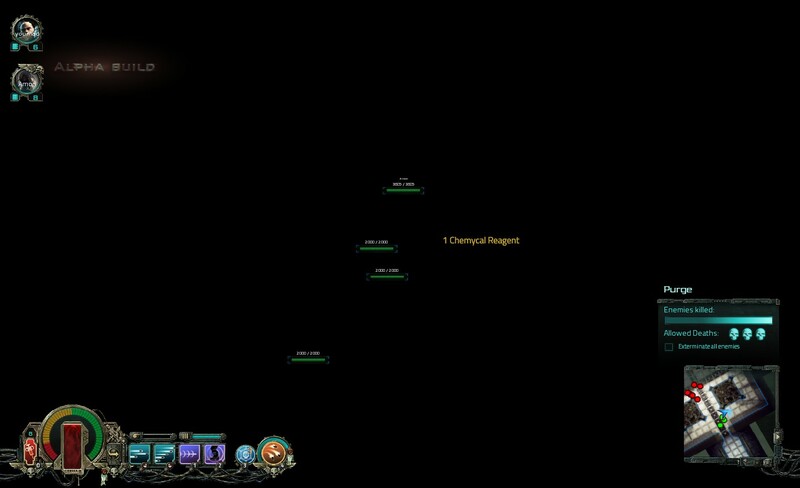 This bug is repeatable 100% of the time on any resolution and with any advanced graphical settings. This includes 2x, 4x and 8x. Thank you for the report! Added to our bug list! Got Exitus Rifle duplicated somehow on my assassin. After the last mission in level 1 investigation, copy of a weapon from my first weapon slot appeared in my stash. No idea how to replicate the bug, though. It was not listed in rewards from the mission, and it's exactly the same as the rifle I've crafted before doing the mission. Possibly crafting-related, as it may have appeared when I claimed a result of a different crafting I was doing during the mission, haven't checked my inventory beforehand. After crafting armor (the only item I've had the issue with), and returning from a mission with it equipped a duplicate will appear in the inventory. Both in inventory and in the worn slot. If the one from the inventory is sold they other will remain, but as soon as you enter a mission the worn piece disappears and you is naked. Ending the mission and returning and it is still gone. Again I've only had the issue with armor and it happens every time across multiple characters. If the duplicated armor is left in the inventory both sets remain and have done so for multiple missions. I just built a new system and upgraded everything except my graphics card. Once the OS was reloaded and all of my drivers, I loaded Steam and all of my Warhammer titles. When I jumped into IM, suddenly all of my higher resolutions are missing. The max res I can choose is 1920 x 1440. Any idea why the higher resolutions that were available before are now missing? EDIT: I restarted the game to no effect. Then I came here and made the above post. When I went back to the game and started it a 3rd time, suddenly the higher resolutions are now available in the drop down menu.